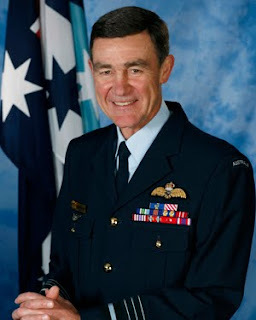 March 18, 2010 - 7:59PM AAP - Defence head Air Chief Marshal Angus Houston is in East Timor for a two-day visit, meeting Australian troops and East Timorese officials. Australia still has some 400 soldiers in East Timor as part of the International Stabilisation Force (ISF) charged with maintaining security. Air Chief Marshal Houston said will hold discussions with East Timor Vice Prime Minister Guterres and Chief of Defence, Major General Taur Matan Ruak, reinforcing Australia's commitment to continue providing security and development assistance in East Timor. He will also meet special United Nations representative Ameerah Haq to discuss Australia's continuing support to the UN in East Timor. "I am looking forward to a productive visit and meeting with our people who are doing an outstanding job in East Timor," he said in a statement. ISF commander Colonel Simon Stuart said Air Chief Marshal Houston would gain a first-hand update on conditions in East Timor since the troop number drawdown last month. "The situation in East Timor has remained stable since the shooting attacks on the President and Prime Minister in February 2008," he said. "It is encouraging to see the progress that is being made not only in the security sector but also in the development and growth of East Timor as a nation."